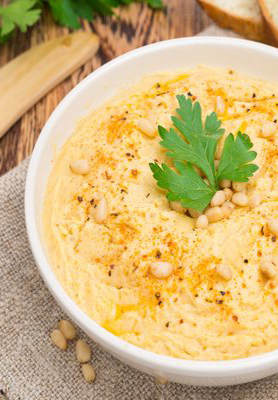 Stop Wasting Your Money On Store-Bought Hummus And Start Making This Delicious Recipe At Home! We didn’t know hummus could get any better, but the roasted garlic and toasted pine nuts in this dish really take it to a whole new level! Roasting the garlic and toasting the pine nuts definitely tack on some time to the total, but they make your house smell amazing and really add a special flavor. We may or may not have a “problem” and end up eating majority of this hummus before it gets to the table, but we wish you luck and support you in your efforts to share this dip with others. Drizzle garlic with 1 tablespoon olive oil and wrap in aluminum foil. Bake for 45 minutes, or until caramelized and tender. In a medium pan, toast your pine nuts over medium-low heat for 3-5 minutes until fragrant. In a food processor, pulse together lemon juice and tahini for 1 minute, scraping down sides in the middle. Add in chickpeas, garlic cloves, pine nuts, olive oil and paprika, and pulse until smooth. 1-2 minutes. Taste and adjust seasoning, adding salt if necessary. Pulse for 10 seconds. If consistency is too thick, pour in 1 tablespoon of water at a time, until desired texture is achieved. Transfer to serving bowl, drizzle with more olive oil and seasoning, if needed. Add pine nuts, serve with pita and enjoy.